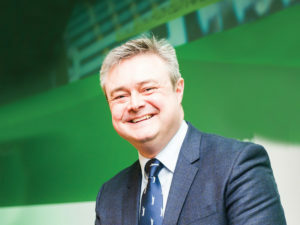 Gary Smith, managing director of Europcar UK Group, speaks to Alex Grant about the company’s increasing focus on mobility and the launch of its new portal. How has the rise of car sharing changed the business and what are customers looking for? We constantly listen to what our customers want from a traditional car rental business, but we don’t think that car rental in itself is going to be the way forward. Therefore we’re looking at total mobility solutions and that can be a number of things – including car sharing activities. And we’ve got two solutions within that sector; Ubeeqo, our Group acquisition that gives us the ability to do car sharing / car pooling within the corporate space; and in 2015 we took a majority stake in E-Car Club, which is really the only fully electric car club within the UK. And that gives us access to slightly different routes to market, because we will work with local government, housing associations and universities, education facilities etc. What other developments is Europcar making in the mobility arena? We talk about being a mobility company but we can offer minicabs and chauffeur services through to car sharing, hourly hire, traditional rental and long-term rental. And we’ve really got a suite of products that give us an offering across all the aspects of that. We’ve just launched a new product in our corporate space which brings all of those products together. The new portal where you have one place to go that gives you the ability to tap into all of our services. Europcar One is the new mobility portal that not only gives fleet managers access to a wide range of transport options in one place, but delivers important environmental and cost advantages too. By bringing all the services together the fleet manager can book, manage and monitor every mobility service available to ensure they are getting the best for their business – and employees. We’ve also introduced a flagship mobility location in Brussels. These mobility sites will come to the UK in the next couple of years and will enable us to look at the different range of services available in Brussels, which is offering more than traditional car rental. We’re actually in a very interesting position as I think the motor industry is not just rental and mobility – it is going to change significantly and probably more over the next five years then the last 15-20 years. The ambition is for us to get the right vehicle in the right place at the right time for our customers and that can be many things – it can be car sharing where they walk down the road and pick up a vehicle, it can be ride hailing, so there’s different aspects to what we’re looking to do and that gives us the ability to start to bring all of those services together. The need for car rental is still going to be there – it might change from urban living to rural living and there’ll be some differences in terms of how the service is delivered but there will always be an element of car rental and we’ll wrap the rest of the services around that. How will mobility needs progress in the future and what role will technology play? In the next five years, there will be younger people who are wanting to be mobile but in a different way, and we need to make sure our technology is keeping up with that. Access to booking on the web is good but we’re seeing a massive increase in bookings coming through mobile devices and we need to make sure that we’ve got the right product and the right offering for the customer needs. Whereas people used to be happy to wait, they now want things immediately. But we’ve always been happy to operate within that space. We can provide cars to be delivered within two hours. We offer a service where we can deliver commercial vehicles within four hours. So that ethos has already been in the business for a number of years and it’s about trying to make sure we work within the customer requirements. There’s probably going to be a greater integration of all travel and transport requirements [in the future]. If you look to some of the other markets, Frankfurt for example has already integrated train and bus and car rental / car sharing into one product and, like an Oyster card, will enable you to draw off all those services. That’s going to come to the UK.